I’m just going to say right up front that while I know what this guy did is wrong, I admire his cheapskate ingenuity, and I think it’s too harsh a penalty to take away his Geo Metro. Here’s the guy’s crime: he rigged a license-plate flipper to avoid paying tolls. In Canada. 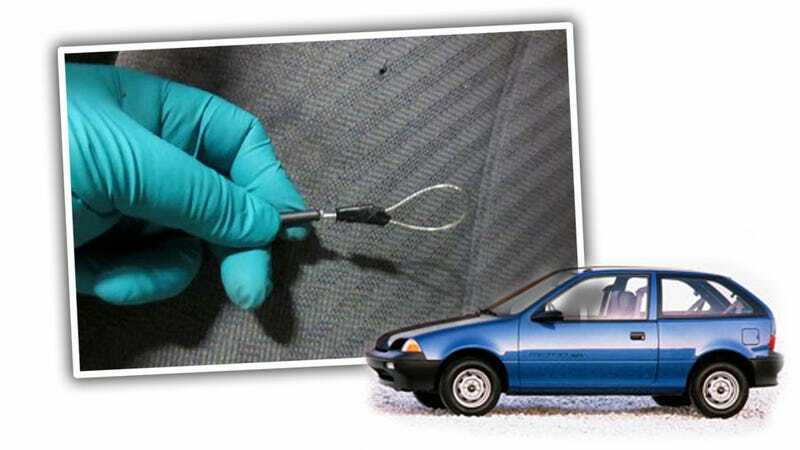 Last December, an especially sharp-eyed RCMP officer noticed a 1993 Geo Metro with no license plate crossing the comically-named Golden Ears Bridge in Vancouver. While watching the car, the Mountie was surprised to see a valid British Colombia license plate slide into place. What unholy sorcery was afoot? It wasn’t sorcery, it was a wonderfully low-rent Q-Division pull-cable setup that let 49 year-old Gregory Murray hide his license plate on demand from toll cameras. Canadian police discovered the system when they followed him and saw the magic happen. Gregory Murray, a 49-year-old Port Coquitlam man, was charged with two counts of fraud under $5,000 on Aug. 6. The car, a 1993 Geo Metro, has been seized, and police are applying to have it forfeited to the provincial government as offence-related property. “This serves as a reminder to anyone actively trying to defeat the toll system that it is a criminal offence and that you could lose your vehicle and face charges,” said Schumann. They want him to forfeit his ‘93 Metro for this? I mean, yes, the guy broke the law, but can’t they just charge him for the tolls and make him pay a fine? It seems like a guy so cheap and/or broke to be doing this — and in a Metro — probably isn’t in the best position to be looking for a new car. Maybe I’m being too soft because I sort of like the guy’s inane ingenuity. I also find a little ridiculous that picture from the RCMP showing the little wire-loop cable being held by the hand in a surgical glove. It feels like they’re trying to make this little cable-rig seem terrifying and deathly serious, like it was a cable that launched heroin darts at children in playgrounds. Oh well. I guess there’s a lesson here — don’t use your home-made license-plate hiding system if you even think there’s a cop behind you. Don’t get cocky; don’t lose your head.